This article was borrowed from the Danville Express and written by Jeremy Walsh. The original article can be viewed by clicking here. 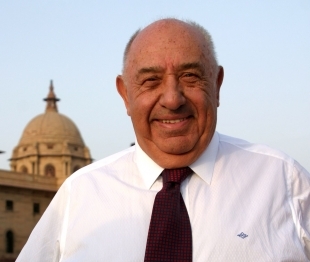 Kenneth E. Behring’s life has been filled with remarkable achievements, but the ambitions that now motivate this businessman and philanthropist are among the most noble, as he strives to improve health conditions worldwide, educate young people and help develop the leaders of tomorrow. “We’re just, in a way, trying to do what we feel is something necessary,” the 85-year-old Blackhawk resident said. Born in Illinois and raised in Wisconsin, Behring grew up in a poverty-stricken family during the Great Depression. He worked a variety of jobs from an early age, entered car sales after high school, soon became a dealership owner and earned his first million by 27. From there, Behring would embark on a truly extraordinary — and lucrative — business career that saw him create the retirement community of Tamarac, Fla. in the 1960s, develop Blackhawk here in the Tri-Valley beginning in 1977 and serve as majority owner of the National Football League’s Seattle Seahawks from 1988-97. But, as Behring describes, it wasn’t until early 2000 (after placing a young, disabled Vietnamese girl in her first wheelchair) that he discovered “a life of purpose,” leading to him becoming one of America’s most committed philanthropists. The happiness and sense of hope emanating from the girl impacted Behring deeply and motivated him greatly. That June, Behring founded the Wheelchair Foundation, which aims “to create awareness of the needs and abilities of people with physical disabilities, to promote the joy of giving, create global friendship, and to deliver a wheelchair to every child, teen and adult in the world who needs one, but cannot afford one,” according to its website. 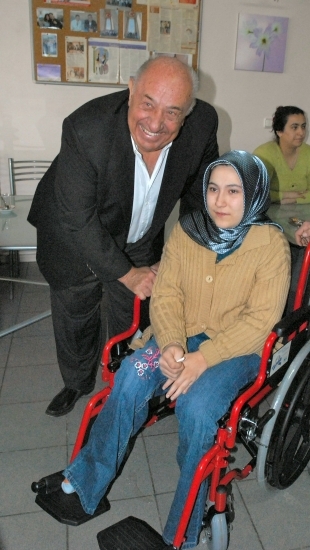 By December 2000, the organization had distributed 20,000 wheelchairs across 65 countries. The Wheelchair Foundation, now a division of Behring’s Global Health and Education Foundation, has delivered or committed 940,675 wheelchairs to date worldwide, according to its website. A contributor to a variety of charitable causes, Behring sees significance in efforts across the globe as well as close to home. He is an active supporter of the University of California, Berkeley Principal Leadership Institute, which aims to train and develop educators who could lead some of the Bay Area’s most underserved schools. “What Berkeley has been able to accomplish is they go to the poorest schools and they find teachers that are very dedicated that do not have money to have continued education, but that are very, what they feel, qualified with what Berkeley can give them to come back and do much more in the schools than what they were doing as teachers,” Behring said. Through educational endeavors such as the Principal Leadership Institute, museums and National History Day, Behring hopes to help young people find a path toward making a true difference in the world. Behring, now in his later years, said he prefers to focus his time and energy on philanthropic ventures and business activities — like participating in the stock market — that help fund those causes. And the deep desire that continues to drive this Tri-Valley Hero is simple. * Behring and wife Patricia celebrated their 64th wedding anniversary in October. * The Behrings had five sons (one died) and have 10 grandchildren. * Behring founded the Blackhawk Automotive Museum in 1988. He has also pledged some $100 million to the Smithsonian Institution museums. * He sold the Seattle Seahawks for $200 million to Microsoft co-founder Paul Allen. * Earlier this year, Behring released a new book, “The Road to Leadership: Finding a Life of Purpose.” All proceeds benefit his Global Health and Education Foundation. Understanding the difficulty of getting around in a wheelchair has been a hands-on lesson for students at Montevideo Elementary. Last week, Montevideo Elementary’s physical education classes were a little different from norm: rather than ball being played on the courts, wheelchair obstacle courses became the main activity. The school participated in the Wheelchair Foundation program, a charity organization rgar raises money for wheelchair distribution worldwide while fostering perspective to younger students who live without disabilities. “For us it’s a whole different world,” said fifth-grader Shrena Sudhakar, 10, who participated in the program. Schools across San Ramon, Danville, Alamo and Pleasanton participated in the fundraiser this year. Last week, students took turns riding and guiding classmates in red wheelchairs around an obstacle course set up by P.E. instructor Michelle Cabrita. Cones proved tricky for students to maneuver around on their own, often being knocked over or caught under the wheelchair. “I tell the students the cones represent maybe a big rock or a pot hole in the road,” Cabrita said, helping students imagine the obstacles others have to overcome. After the lesson, students talked about how much work it took to get around in the wheelchairs. “It changed my perspective because I thought you could just zoom around places fast [in a wheelchair], but it took me so long just to get to the half-way point,” said Zaid Fattah, 10. “I never want to do it again in my life because my arms ache,” said Kavya Anand, 10. To see more photos and videos of the program at Montevideo Elementary, click here. Mr Ken Behring along with Rotary providing mobility to children in the Seychelles. The Rotary Club of Victoria in partnership with an international non-profit body called Wheelchair Foundation have together brought added comfort to the lives of 10 people with physical disabilities. Ten wheelchairs were handed over recently at the School for the Exceptional Child in the presence of the foundation’s founder Ken Behring, it’s Director Charli Butterfield and other members. Also present at the handing over ceremony were the President of the Rotary Club of Victoria Mario Rotolo and other members, as well as representatives of those who have benefited from the donations. They expressed words of thanks to Rotary Club and the foundation for such gifts which will help to promote inclusion of those children and adults in various social activities. Six Students from the school have received wheelchairs, tow have been given to the Sisters of Charity while the North East Point home for the elderly has got one. The other wheelchair was given Yva Valmont, who is suffering from a medical condition called cerebral palsy which affects her mobility. The Wheelchair Foundation is a non-profit organisation leading an international effort to create awareness of the needs and abilities of people with physical disabilities. Mr. Behring and his team from the foundation are going around the world making donations in various forms such as wheelchairs, equipment for schools and humanitarian work. Mr. Rotolo said Rotary Club is always trying to help those who are in need in the different communities in the country through various projects. He added that this donation of wheelchairs comes after a visit of a foundation’s member last year during one of the club’s meetings. Discussions have been held since then and a partnership has been developed. On Thursday, September 26th 2013, there will be a special advance screening of the movie RUSH from Two-time Academy Award® winner Ron Howard (A Beautiful Mind, Frost/Nixon) at Century Theatre in the Blackhawk Plaza at 7:00 pm along with a reception that begins at 5:30 at the Blackhawk Musuem. A $25 per person donation* will secure your tickets to this wonderful night. All proceeds from this “Wheels for Wheelchairs” event will go towards the Wheelchair Foundation’s goal of providing a free wheelchair to every child, teen and adult worldwide who need one but has no means to acquire one. Haven’t heard about this epic story? Watch the trailer below. In August of 2013, Wheelchair Foundation shipped 110 wheelchairs to Fiji. Below are excerpts borrowed from the Fiji Sun.com news articles which you can read in their entirety here and here. Receiving 18 of the 110 delivered wheelchairs, the president of the Rotary Club of Fiji, Adrain Hughes, said wheelchairs were one of the most resourceful elements in the lives of the disabled in our communities. “We are very thankful for the supportive assistance by Vodafone ATH Foundation, and the Ministry of Health, who assisted in bringing the wheelchairs into the country duty free. One thing that is very evident is that people are working in a collaborative effort to assist one another and mainly the people in need.” The hand-over of the wheelchairs was held at Albert Park, in Suva. Rotary club president, Andrew Hughes (third left) with members of the “Wheelchair Foundation” of the US after the wheelchair donation at the Vodafone Hibiscus Festival 2013’s main stage at Albert Park in Suva. Photo Courtousy of the Fiji Sun and PAULINI RATULAILAI. Vodafone ATH executive Ambalika Devi said they continuously work towards supporting the disabled and needy people of the community. Wheelchairs were given to the Kidney Foundation of Fiji, the Father Law Home, the Old People’s Home, and others after an assessment was done. Kidney Foundation Fiji received two. Its president, Diwan Chand Maharaj, welcomed the support coming in for the disabled. The Savusavu Rotary Club, the Labasa Rotary Club, and the Labasa Lions Club were among the recipients this week. Chetan Singh Heyer, a former resident of Ba, now residing in the USA, is deeply involved with the fundraising arm of Wheelchair Foundation. Action for Children and the Aged (ACATA) executive director and Vodafone World of Difference candidate, Rosan Lal, said that there was a huge demand for wheelchairs in Fiji. The chairs will serve as a tool for the disabled to enjoy life and get around. “It provides an opportunity for a person to be more productive and even make a living,” says Mr Lal.